The vast white sand dunes which we refer to is located in Quang Phu commune, the center of Dong Hoi city about 8km, bordering commune Nhan Trach, Bo Trach district, a land of rich culture Sea fishermen village. 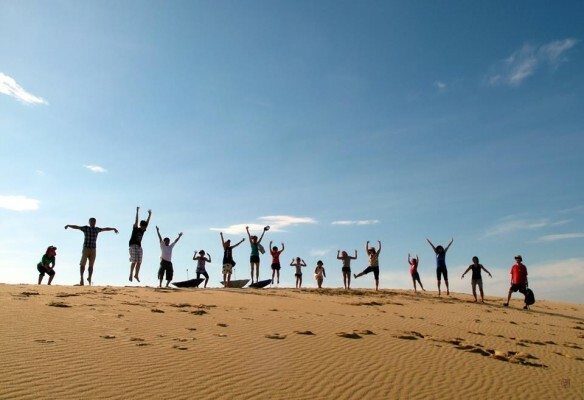 Sand skiing, an interesting travel experiences in Quang Binh Not only own a beautiful cave system magnificent, Quang Binh has many beautiful beaches and white sand dunes immense. 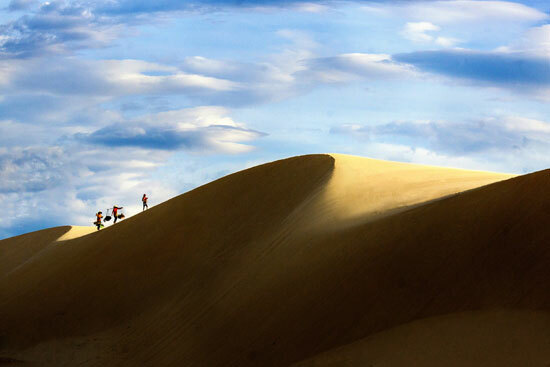 Unlike the dunes in Phan Thiet and some areas of Quang Binh dunes converge many unique elements to make an ideal tourist landscape. White sand dunes with crystal shine sunny sandy grassland stretching coast to watch green, clean has never affected the landscape and environment. Sand hills with elevations reasonable to design the adventure game. One is walking on the sand, conquer challenges and sand would be an impressive holiday for those who join the tour experience Quang Binh sand. With compelling experiences that many travel companies tourism in the province is taking the game slip sand, sea village to visit … to test his tour and is attracting many visitors registered participants. A tourist from Canada said: “I feel very interesting, fun and exciting to experience games in Quang Binh sliding sand. Quang Binh is the land of many sea, sandy so I think that if exploited this activity is very great “. With such advantages, recently Quang Binh has promoted development of marine tourism with many new products, including sliding sand game is attracting many tourists to participate.